A really healthy alternative to pizza and kids love it. arrange the tomatoes in the bottom of a dish. Then trickle on a tablespoon of olive oil. 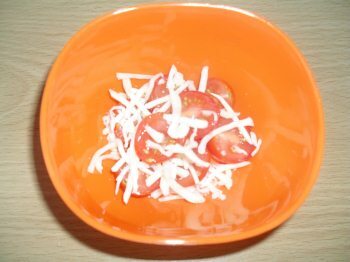 Now add the grated mozzarella cheese to the dish. Finally put in the fridge for 30 minutes to chill before serving. This is a really light and tasty meal that toddlers can eat as finger foods. You can add this to any other meal or add as a side dish or just eat it on its own. Try experimenting by adding other ingredients into the mix you will soon find out your toddlers favorites. This salad is great for the summer and can be part of a picnic basket. It's also super quick to prepare so is a really healthy toddler recipe. The best kind of convenience food you want for your toddler. Catch them young with healthy food for toddlers and they will stay fit and healthy for life. So go and give it a try today then let me know how it goes. does your toddler love ot hate it. Do you use it as a side dish or as a main meal with bread ? You may be interested in having a look at our Summer salad which uses other tasty salad ingredints.